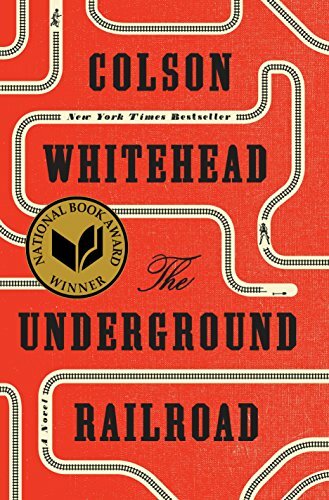 The Underground Railroad by Colson Whitehead tells the story of 15 year old Cora, who runs away from a Georgia Plantation to obtain her freedom. Whitehead never actually tells us the date, but it is before the Civil War…California is mentioned a few times, and CA received statehood in 1850, so we can assume perhaps somewhere around then. The Underground Railroad is told in chapter vignettes almost, with varying and fleeting characters, but with Cora as the driving force of the narrative. And a force she is. Even at 15 (someone is her position was no doubt forced to grow up fast), Cora is strong, resilient, brave, and has an unrelenting drive for survival and freedom. She never gives up, even when she witnesses death and horrific atrocities all around her–even after she flees the plantation in Georgia. Cora’s strong drive is the soul of this book, and without it, I don’t think Whitehead’s spare style could have fully worked. There is very little dialogue in TUR, which is quite a different style from what I’m used to reading. Second, events jump around and new characters are dropped in without much introduction which made for a disorienting read at times. I found myself flipping back a few times thinking I’d missed something. I also found some of the language to be too modern for the time period, as well as a few of the places (was that town in SC based on fact? I’ve never heard of it? The museum seemed very modern to me, as well as the “skyscraper”.) So if that type of style isn’t your thing, but you still want to read this book–just focus on Cora and the overall message of empowerment, as well as Whitehead’s unique, visceral, and visual descriptive language. An interesting note about this book is that the Underground Railroad is manifested as a real underground railroad. I read an interview with Whitehead where he said this decision came from when he was young and first learned about it, he always thought it was an actual train and was disappointed to later find out that it was not. The choice to make the railroad a real train that traverses miles of underground tunnels perhaps symbolizes dreams and hardships made tangible. Cora often thinks of her own mother (Mabel) who escaped the plantation without her, but (without giving away spoilers) the reader comes to find that Mabel is a legend or a symbol of hope despite her true, unglamorous fate. TUR is heartbreaking and introspective, and should be read by those interested in both history and current affairs. The points Whitehead makes easily apply to today’s events, and I found myself getting hit square in the chest with the emotional punches his wise prose provides. Overall, TUR is almost less about the narrative and more about the message.